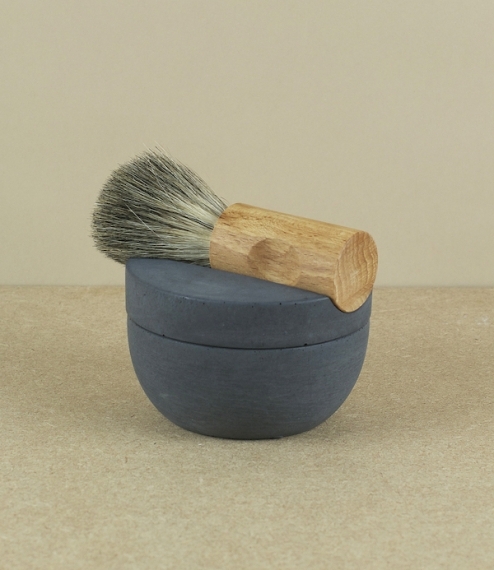 A maple and badger hair shaving brush, 'soft' concrete cup, and handmade cedar-glycerine soap. Badger is renowned for its excellent lather, and softness against the skin. In Sweden, there is a tradition of visually impaired craftsmen finding work in the manufacture of brushes. This continues today in the form of Iris Hantverk, which employs 30 such individuals in the production of some of the worlds most beautiful and high quality brushes. Sold separately.